Today is Columbus Day, which means that government employees and a few lucky others get a day off work. The holiday celebrates Christopher Columbus’ “discovery” of the Americas, which happens to be an important date for cigar fans. That’s because Columbus is widely credited with introducing the tobacco plant to Europe, which set in motion a series of events that culminated in the cigar industry we see today. It was during Columbus’ voyages to the new world that Europeans first encountered the tobacco plant. According to history, it was two of Columbus’ crew members who were most responsible for bringing tobacco to Europe. Both, Rodrigo de Jerez and Luis de Torres, took a liking to tobacco after seeing native Americans smoking the leaf. 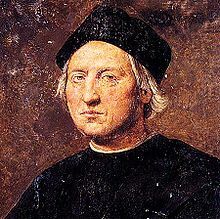 After arriving in Cuba in November 1492, which Columbus thought was the Asian coast, Columbus sent Torres and de Jerez inland to explore the country and to contact its ruler. The two men were received in an Indian village where they saw the native custom of drying leaves, inserting them in cane pipes, burning them, and inhaling the smoke. Upon his return to Spain, Jerez continued smoking and introduced his habit to his home town of Ayamonte. The smoke reportedly frightened some of his neighbors, resulting in the Spanish Inquisition imprisoning him for his use of the “devil’s weed”—making Jerez the first victim of anti-tobacco laws. He spent seven years in prison for his “sin,” only to be released as smoking was becoming an accepted activity in Spain. One legend has Torres being threatened with prison in Spain for smoking tobacco, but in all likelihood such stories are confusing him with his fellow sailor. The more accepted history says that Torres was killed while settling Hispaniola (now the Dominican Republic and Haiti). Internal conflict wiped out the settlement party when Torres, a Jew who became Catholic under threat from the same Spanish Inquisition that later imprisoned Jerez, took issue with attempts to convert the native people to Catholicism. Whatever the exact truth, there’s no denying that Columbus and his crew were pivotal in the history of cigars. And that is reason enough to light up a cigar fine this Columbus Day. Thanks for reminding us of this aspect of Columbus' legacy. I used to live near Columbus, KS where Columbus Day is always a big thing, but the tobacco part of the story never got told!